Setting up your UI for the first time will take you a while if you modify it as heavily as I have done with mine. When 4.1 completely broke all of my addons and I had to rebuild everything from scratch, it took me a little over two hours to get everything from default UI back to the way this was set up. My UI is constantly evolving and if you’ve been following me for a while you may notice it slowly change over time. I’ve got everything almost completely perfect and most of the changes I make now are really small tweaks here and there. Pitbull is a unit frame addon that moves your unit/party frames around and can be customized a LOT. The main difference you’ll notice in my unit frames vs. the default is, aside from the location on the screen, there are no pictures. One of the things I try to do with my UI is to strip out all the unnecessary info and only have the important stuff on there, so pictures of the toons were the first thing to go. The only units I display are [from left to right] myself, my pet, my pet’s target, my target, my target’s target [not shown here], my focus and my focus’s target. That’s it. I do not have party frames, even in a 5-man dungeon. Grid replaced my party frames and Pitbull shows me only the things I need to see. I only display buffs/debuffs that need to be shown and don’t display them on things that are likely to be redundant. For example, my focus is almost always the tank, and his target is always the boss. I don’t need to see my focus’s target’s buffs, because I can see them on my target frame. My pet’s target doesn’t have buffs/debuffs for the same reason… it’s going to be attacking the same thing as me. 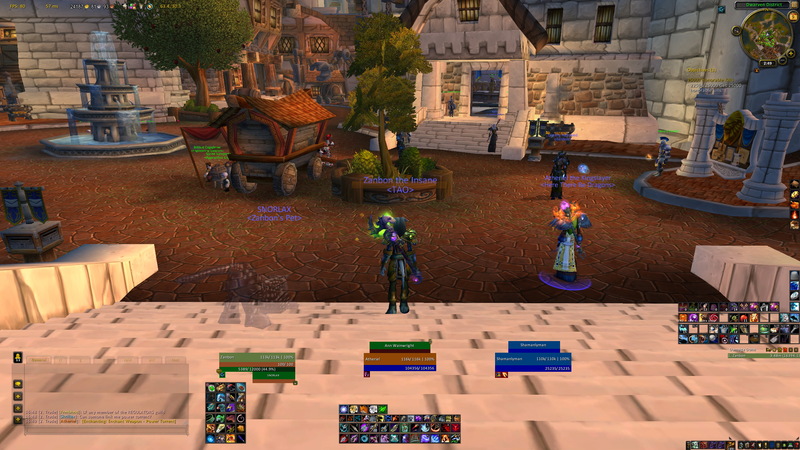 Bartender allows insane amounts of customization with your action bars. You can move them wherever you want, change visibility, set up keybinds in seconds and do insane amounts of customization in about 10 seconds. This is a fairly old screen shot so my setup has changed a bit, but it shows my UI with all bars visible so you can see where the “hidden” ones are. I only display 2 action bars, my aspect bar and my “pet bars” full time. The rest fade out unless hovered over. Deadly Boss Mods is probably the most important addon anyone could have. It tells you SO much information. It tracks when things are going to happen during a fight with timers, shows you when a boss is casting an important move, tracks events like stacks of a debuff on the boss or a player and warns you when you are standing in the wrong place. They recently added the Range Radar, which I think works SO much better than using the old /range 6 because it shows you exactly where the people around you are so you know which direction you need to move to get away from them when you need to spread out. Serenity, the newest incarnation of JS Hunter Bar, is easily my favorite addon. It moves my focus bar right in front of my face so I know exactly how much focus I have so I know what shots need to come next. It times durations of buffs as well as cooldowns on abilities, so I can easily see how long my Rapid Fire is active and how many minutes until I can use it again. It shows which aspect I am in so I can make sure I’m in Hawk when standing still and will know right away if I’m not in Fox when I need to move. It also warns me when there is an enrage on my target to Tranq off, and in PvP it shows me what buffs I can purge off my target. It also alerts me if Hunter’s Mark/Marked for Death is not applied to my target. ALSO, it shows the health of my target, my auto shot swing timer and has a nice little visual mark on the focus bar so I can make sure I always have enough focus for my signature shot. Such a good addon. Every hunter should have it. As you can see in this screen shot, I’m in Aspect of the Hawk, have 1 second left until I can cast Chimera Shot again, have plenty of focus to cast it when it’s available, don’t have Serpent Sting up [bad hunter!! ], have 9 seconds to reapply my Improved Steady Shot buff, and my Rapid Fire will be ready to use again in 2 minutes. Quartz, also seen in the above screen shot, is a visual cast bar mod and I use it to show the cast time of my focus shots, so I can queue them up for an almost completely uninterrupted rotation. Below my own cast bar I have my target’s cast bar so I can interrupt casts when needed or so I know when to move in/out of something. I include timers on there because knowing exactly how long a cast is going to take is really useful to me. As you can see, I’m .5 seconds into a 1.3 second Steady Shot and Ragnaros has 1.3 seconds left on his Sulfuras Smash, which tells me I have 1.3 seconds left to move the hell out of the way if I’m in the path of the smash. Recount is highly questionable as far as its usefulness goes. It’s great to have a semi-accurate log of what’s happening in a fight, but so many people tunnel recount and care more about what those little bars say than about paying attention to the actual fight, so I’d honestly rather people didn’t have Recount until they know how to pay attention to what’s going on around them. You do zero DPS if you are dead! However, you can find out a LOT of useful information from your Recount. You can see how many shots you fired and what percent of them crit/miss/absorb. This is useful for checking things like Wild Quiver procs, Flaming Arrow procs, etc. You can also check Recount to see what happened to cause someone to die, how much damage someone took and from what [were you standing in fire?? ], your uptime during a fight, how much energy you gained, etc. Recount isn’t just for measuring the size of your e-peen. It can actually be used to learn how to improve your performance. Omen is insanely important to have as a Raider. Not only does it have a visual meter of TPS, it also has an audible alert if you are not the tank and you’re pulling aggro. I’ve also got mine set to flash and turn the edges of my screen red when I’m pulling aggro. Why does anyone other than the tank need to worry about aggro? Because as a DPS or healer, you need to make sure you’re not PULLING AGGRO off the tank! The tank is built to withstand those hits, you are not. Omen warns you if you need to pull some threat dumping tricks out of your bag to make sure the tank KEEPS his aggro. On a fight like Chimeron, there’s a reason hunters are usually the last ones standing. Watch Omen and dump your threat whenever you’re getting near the top. We have Feign Death and Misdirect for a reason. USE THEM! You actually can’t see nameplates in my screen shot because the top of Ragnaros’s head is well beyond the top of my screen, so I pulled a screen shot from someone else. Tidy Plates is useful because it can be configured to show percentages, so you know which adds you need to be focusing first. It also makes selecting a target a million times easier because when adds are clumped up like in this screen shot, it’s hard to click on a specific target by selecting the actual target. It’s much easier to click on a gigantic nameplate. I find this particularly helpful in PvP situations. Grid doesn’t have a TON of use for us as hunters, but it’s still good to have. It completely replaces raid frames, which is great, because the giant default frames Blizz put in are great for healers, but what the heck do I need all that info for as a DPS? All I need to know is which group am I in and is everyone alive? I’ve got my grid set up to show me just thaat. 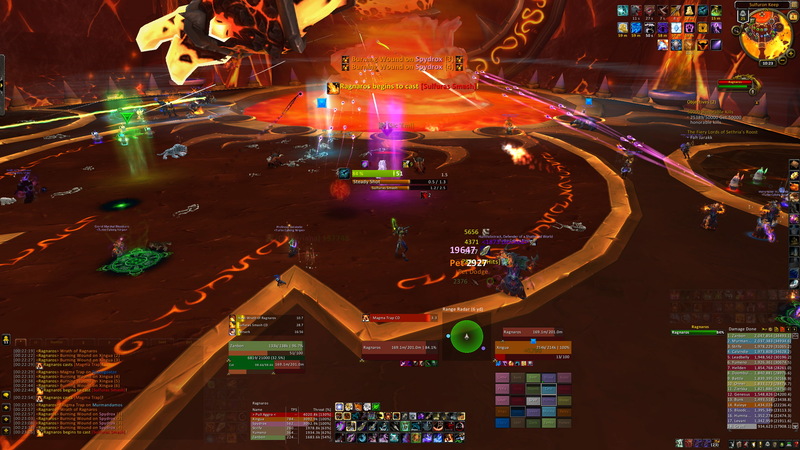 I’m in group 4, which means I am on the right side of the room for adds and I can see that everyone is still alive so there’s no need to find a quiet corner to FD in while the rest of the raid wipes. Mik’s Scrolling Battle Text is great because it takes all the numbers that fly around on your screen and organizes them into a single, pretty area. I can see if I have incoming heals and can see what kind of damage I’m doing. Here I can see that my last Arcane Shot crit for 19.6k, my pet just crit for 2.9k with an auto attack, my last Steady Shot only hit for 4.3k [1.8k of which was blocked] and I just got a Wild Quiver proc that hit for 5.6k. On a fight like Heroic Shannox, being able to easily see how much your shots are hitting/critting for is important because you need to crit Rageface for 45k to stop him from Face Raging people to death. I don’t have any Needtoknow alerts visible on this screen shot, but I use it to track cooldowns on abilities that cannot be tracked through any other mod. The improved functionality of Serenity has almost completely made Needtoknow obsolete, but when JS Hunter Bar broke with the last patch, I used this addon to time all of my buffs, debuffs and shots until I was able to find the replacement. If you could only have one addon in the entire game, I would choose this one. It takes a lot of time to set up, but you can use it to track literally everything. Tiptac modifies your tooltips and allows you to move where they display and can be configured to show a range of information. I choose to have it show just the basics… name, guild, level, race, class and who they are targeting. You can also have it show spec, talent tree and a huge range of other information. I don’t use crazy textures or flashy graphic addons. I like everything to be clean and simple. I use Calibri for everything [courtesy of my font mod, Tekticles] and I use the “Flat” texture on everything I can change the texture on. My cast bars use “Aluminium” texture because I wanted the cast bars to stand out just a little from the other bars on my screen. The most important thing to keep in mind with your UI is to only show the info you NEED. I am not a fan of UI suites because I think everyone should set up their UI in a way that works best for them and not try to adapt to using someone else’s setup. But if you do not want to create your own UI and want something that you can just download and use straight out of the box… I recommend Kripp UI, designed by Kripparrian from Exodus, one of the best hunters in the world. His setup is fairly similar to my own in utility and abides by the “only show what you need” philosophy.